As you know I've recently discovered the world of (entertaining) personal finance blogs. However, until I have good advice or have achieved an amazing goal, you won't see me writing one. One of the blogs I now read is Christian Personal Finance﻿. And there, I heard about the 10 Day Give. The mission, should you choose to accept it, is to give something to someone every day for 10 days. There aren't any rules. You can give your money, time, talent, creativity, or just a listening ear. Any day you decide to give is a good day, so why not start on October 1 and go strong for 10 days. As bad as it sounds, I feel like I have to prepare to give, especially if I'm trying to do something outside my normal realm. I'm going to have to have cash on hand if I want to donate to the Denver's Road Home (10 year plan to end homelessness) parking meters that are on the sidewalks downtown. I'm going to have to seek out people and be brave enough to offer a gift. I'm not sure exactly how this is going to play out, but I'm willing to try. What? You want to give something to someone? There is an option for audience participation! Earlier this year I coordinated a shoe drive at work to benefit Soles 4 Souls. Now it's time for another one. This time as a part of the Flippin' Good Deeds Challenge. You will have a chance to give your gently used shoes another chance. I will have all the details posted here in the next few days. Most of us have more shoes than we need. 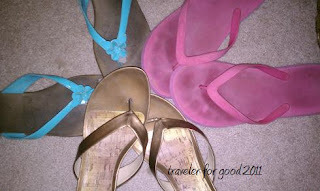 These flip flops were just the top three pairs on the shoe pile in my closet. A pair of shoes might not seem like much. But for someone trying to apply for a job or go to school a single pair of shoes can make a big difference. It doesn't matter where in the world you are. For fun I will try and find good feet quotes through the remainder of the Flippin' Good Deeds Challenge.